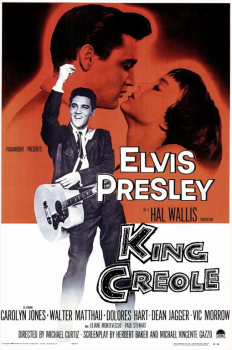 In January 1958 Elvis came to New Orleans to film the movie King Creole. The epic was Presley's last black and white film and was said to have been his favorite role of his entire career. My dad, Honest Joe, who grew up on the streets of the Big Easy, and a few other tough looking neighborhood boys got a job with the film crew convincing the locals to remove anything on Bourbon street that didn't fit the 1920's theme of the movie. The teens worked earnestly to remove window air conditioners, garbage cans, flower pots and signs. Locals that didn't cooperate, often found their stuff missing in the morning. The boys did such a good job, the film crew allowed them to hang out, watch the filming, run errands and act as extras in the movie. My dad is so proud that he helped "The King". It's been over 50 years and he still mentions it from time to time.